sorry we have been extremely bad at keeping up with the posts. Reason: we moved! We have been living in Singapore for the last few months and we will be here for the next foreseeable future. This means that the next posts will be mostly about our adventures in this side of the world. Hope you enjoy it! To start off our South East Asia journey, let me register here the key things about Singapore. These will be the topics that you will see me talking about in the future posts. People: what a melting pot! We will try to capture here some of the interesting things that we learn about this fascinating mixture of cultures that is Singapore. Food: needless to say, Singapore is a paradise for foodies. Because of its location and immigration, here you can find food from anywhere in the world! So far the places we like to eat the most are the Hawker Centres. Parks: it is very true that this is a City in a Park. There are so many parks, gardens and nature reserves that you can get lost in nature throughout your whole stay. Some are good for a stroll, some for flower watching, others for proper hiking and others to stay away from…at the end of the day, this is still a tropical country with all sorts of wild life. Cultural Sights: because of the Chinese, Malay and Indian influence, in Singapore you can find very interesting places to visit. Mosques, temples, Little India, China Town, Arab Quarter. All with its own beauty and keeping true to its origins. Walk around Little India on a sunday and you will really feel like you are in India. Modern Sights: Singapore is a super modern country that got developed exponentially in the last couple of decades. Because of that you can see shiny new constructions all over the place. 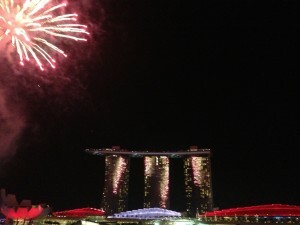 Special ones are of course Marina Bay, Gardens by the Bay, Orchard Road and Sentosa. Glimpse of Paradise: despite the modern feel around the CBD (Business District) you can still find pockets of Paradise in and around Singapore. Cross to the very end of Sentosa Island to have a spa retreat in a tropical jungle or go to Pulau Ubin to cycle in the wild. Night life: anything from sky bars to karaoke bars. Here you will find whatever you are looking for. Travel: from Singapore one can go very easily to places like Bali, Indonesian Islands, Malaysia, Thailand, Cambodia, Vietnam and and and. The list is huge. Hopefully you will enjoy Singapore as much as we are.